Those clay scraps left from throwing and trimming the pots are put in basins and left to dry off to the side. They go from bone dry clay, to slaked with water till mushy, then they're allowed to firm up to still too soft, but almost workable. It really adds up fast. Hard to imagine this can eventually become anything interesting. To recycle, it's scooped out blob by blob and put on plaster batts to pull out excess water. As soon as the clay is not too super sticky, it's wedging time. 3 1/2 hours of reclaiming and wedging. This is what 130 lbs. of recycled and wedged clay looks like. Off to take a couple of Advil. Posted on February 8, 2017 by Mimi Stadler. I have various ways of making a living as a potter. I teach in my studio, do "date nights at the pottery", do "'girls' night out" there too, do an outside gig teaching once in a great while when asked, sell a bit from my website (especially at holidays but also in wedding season), and sell a bit from my home/studio gallery. Another, admittedly minor way, is doing one-day shows. Back on July 21st, 2016, I blogged about how I was Done Kissing Frogs, as I thought of these small local shows. Yet I did this little show last month despite all. That does seem incongruous. So I guess I really owe us (or at the very least, myself) a breakdown of the event. The old expression "Let's get down to brass tacks" means looking at the bottom line and seeing the tangibles. The bottom line here, however, may be a little wavier and intangible than you would think. Facts: Sunday show near NYC, one hour or so away. My second year there. In addition, I discussed a potential custom order for $165, which may raise my take-home to $355. In essence, I worked pretty hard to make perhaps $165 and perhaps $355. I do want to point out that that is $165 or $355 I would not have made by staying home that day instead. 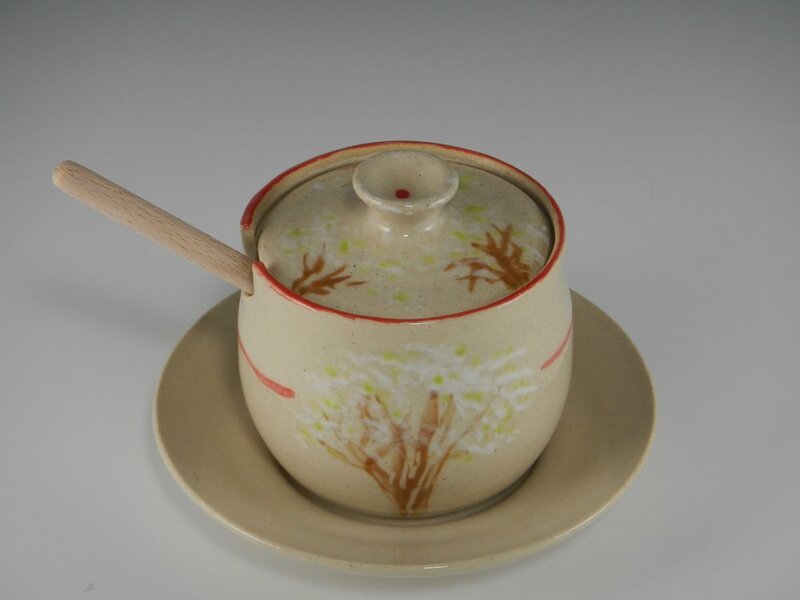 To be even clearer, I have found that these 4-hour gift shows rarely generate more than $400 in sales for me, and other potters whose work is wonderful have told me the same. When the higher-end jeweler next to me asked at the end of the 4 hours, "Did you make $1000?" I just said no, but inside I had a small dry laugh. My husband quotes his mother, who had a head for business, "If you sell pins, at the end of the day you're left with pins. If you sell diamonds, at the end of the day you're left with diamonds." Until I am a national name (or at least until I am an even moderately popular regional one) as an artist, I make pottery, not high end jewelry. Not quite pins- it is an art form (all philosophical discussion of art vs craft aside)- but also, not (yet) it isn't diamonds. To contrast costs, the jeweler's initial outlay for materials is much greater than mine since she uses semiprecious stones, gold and silver. Clay is very cheap in comparison. In her case, the work is mostly beaded and not actually formed in metals from scratch, so the making of a piece might be roughly similar in expenditure of time to me making one of my pieces. But my outlay of time is much greater in dealing with the show itself. For example, I don't just roll it all up carefully in a cloth in 5 minutes at the end of the day and stack up my paper stands, leaving with less than 10 lbs of stuff on one handcart as I waved a breezy goodbye. At my space, just packing up afterward took an hour and a quarter, and I had 6 heavy boxes to trundle out to my car long after she and her assistant (hmm, what is an 'assistant'?) had hit the road. Setting up had also been quite unequal; mine had taken over an hour and hers, 10 minutes. But added to this negative assessment is one pretty valuable intangible this time, which is something I am not used to saying. And it's why I'm not sorry I Kissed This Frog. Because of well-considered thoughts from a good, very selective repeat customer at this show, I had a small but real paradigm shift. I formulated a bit of a change in strategy for what I bring and how to set up the next gift show- and 1-day shows in general. This is worth a lot. For example- 'I love that color blue', she told me. 'But I won't buy that goblet until I see other goblets next to it, and can make a choice.' Likewise, she declined to buy a tureen she was noticing (actually a nice size for soup or stew for two), although she liked the idea. 'Too small to really use for much,' she said. 'If you had that in other sizes I would buy one.' Thinking that over a couple of weeks after, while shopping at a large armory craft show with lots of artists and customers (and where I bought one of my kids a beautiful handmade travel guitar), I verified her words when I looked at the booth of a well-stocked potter with work qualitatively akin to mine. I saw the wisdom in my customer's opinions. A shelf unit of mugs had a couple of dozen similar mugs- in different colors and side by side. Bowls were similarly displayed, in a few sizes, and so on. Items generally similar in feeling but in different colors and sizes were shown. If I liked what I saw, I could choose easily. I believe I will even do this little show again- don't shake some sense into me, please. I want to test the waters again there. Call it a mini semi-longitudinal test case. Besides the intangible benefit of getting out of the studio and talking to folks (nothing to sneeze at in the fairly solitary life of a potter), these constructive ideas are also sharpening my focus towards making particular objects in a more organized way. These are not new things- I want to keep making them anyway-- I'll just stick with them longer, and make more variations in colors and sizes on each single theme. I'll still make one-offs because I love to. But they will be in addition. And I am also going to reach out to the organizer to help make this particular show better. I have more ideas about publicity and marketing. The things I gleaned will affect whatever shows I do, including wholesale gift (when the Saturday night/Sunday-only (usually Judaica) ones come up). The simple schooling was worth much more than the $190 I made or the $355 I might make. Only by showing my work, even at the (very) occasional Kiss-a-Frog show like this, can I get a certain kind of cogent feedback. More on that feedback, or How to Set Up a More Appealing and Lucrative Show, in a future post. Posted on January 4, 2017 by Mimi Stadler. I was invited to three one-day shows lately. All were for Sundays in December. Two of the venues I've done before, one with some success and the other not so much. The other one I have not done before. I opted to do one of the ones I had done last year, turned down the other less successful one, and decided not to even try the new one. The following is a quick analysis of why I chose one and rejected the others. Most potters/craft artists who make sales regularly will do at least a couple of two- or three-day wholesale or retail shows each year. These start on Friday afternoon and end Sunday late afternoon. Those who do these tell me they are their bigger moneymaking shows of the year. A retail show will bring you immediate money and feedback, with varying levels of success. A wholesale show may enable you to gain new customers that ask you to write up sales for the rest of the year. It cuts deeply into my income potential, that I have Friday evening and Saturday put aside for the Sabbath for, oh, the rest of my life. Since I don't do business on Sabbath, and while I can't know by exactly how much, the income I'm missing is without question pretty significant. I have needed to find ways to compensate for not doing the weekend wholesale or retail shows. I've been known to wake up at night and lie there thinking about this as I toss and turn. I'm working on the problem constantly. So I may do a one-day show now and then, in addition to the other roster of ways I make money & sell my work: I have the occasional drop-in customers to my studio gallery, web sales on my site, and getting work into shops or galleries the old fashioned, legwork/phone/email way. I have students 6 months a year and offer date night for couple or friends in the winter. Back to those one-day shows... The ones I might do on Sundays are, by contrast with the weekend ones, a lot of work for an abbreviated benefit. Having done a number of these, I understand that the amount of work I must put in preparing for what is often only 4 or 5 hours is disproportionately labor intensive and possibly will not bring in much in sales. You might argue that the show fee is usually fairly small, less than $100 and/or 15% of sales to the venue, say, as opposed to perhaps $1000 or more to rent a booth location at a big weekend show. But sales are much, much smaller. An intangible: I consider the one-day show a way to test my work and my setup in a community venue, and see how my pieces and my prices 'play in Peoria'. But since I want to make back my show fee, sell at least a few pieces besides, and still feel I came away with enough to pay for all my time, effort, and let's not forget, get paid for the art I sold, I choose as carefully as I can. The right choice of this one-day type of venue is where other people will be selling their handmade art and jewelry. If I can find handmade wearables, hand-fashioned fine woodwork, artist-fabricated glass or metal, or interesting mixed media or other constructions or sculpture, that's a clear indication of a show with potential. If the show is well publicized, motivated customers come in the door, expecting quality work. Pointing out the obvious, you want motivated customers. I may get on-the-spot sales AND some people may ask to place an order for items they have in mind and don't see on my table and shelves. If the price points of my sales pay me for the craftsmanship/artistry I bring to my pieces, I can make some money. The wrong one-day venue? That's where you find mass produced imports and non-handmade items, no matter how pleasant they may be. As a professional artist-crafter, I would likely find that people will pass me and my goods by at this kind of gift show, with a hand shielding their eyes from me (yes, that happened) so that I would not, heaven forbid, think they might even want to look at me or my probably-too-expensive-who-needs-it wares that don't belong here. Awkward. I've done these gift shows in school gymnasiums and community centers where I think it actually hurt my credibility to take part. I'm so leery of doing another of these that my basic instinct is to run the other way, fast, when an invitation comes in. Why did I choose to be part of this show again? Well, I made a decent few dollars last year, but most of all, the people who put the show together to benefit their organization were friendly, fun and smart. The location last time was in a senior living center with lots of guests, residents and caregivers coming through. If that sounds undesirable, well, it worked nonetheless. This year, the venue was changed to a building nearby, where community meetings take place and there is a Sunday school. Theoretically, the walk-ins should have been plentiful. However, school let out at noon, and our show was scheduled from 1-5 PM. Had we scheduled for 11 AM-3 PM instead, we might have caught the attention of the parental crowd before their children came out. It is a relatively affluent urban area, after all. There was also some kind of dedication ceremony going on in another part of the building before 1 PM, but no sign in the lobby to direct people from there to look in on the gift show in our area of the building afterward. (If any of the coordinators are reading this, are you smacking yourselves in your lovely foreheads?) In addition, although plenty of automobile traffic passes by there, there was no sign outside or on the corners of surrounding blocks. And the flyer, which contained only text and no necessary photos, was an email only, that went out just a few days before the show. Maybe it's a little weird that I'm not sorry I did this show, considering I sold just six pieces. I still enjoyed it because those friendly, comfortable people bought just enough pottery to make me feel it wasn't a loss. I had such a good time with them that am going to try and work with the organizers, if they will let me, to make this a better show next year. I will have advice: Mix it up more with the vendor types. Publicize with flyers and posters as well as two or three emails. Go beyond your own organization to publicize, by asking vendors to use their own email lists (besides your own mailing list) a few weeks before the show, then again soon before. Choose the right date and time. Put up small posters in public spaces of local libraries, synagogues, churches, etcetera. I'll get down to brass tacks on the economics of being a craft artist doing this kind of gift show and looking at other potential markets in next week's post. Posted on December 12, 2016 by Mimi Stadler. Who gets to be like a kid every day and come home at the end of the day dirty and tired and happy to be? I'm grateful for students and customers who help me keep doing what I love to do. Posted on December 1, 2016 by Mimi Stadler. When you make original work you tend to take your time to get it right. I don't just whip up a batch of pots like they were cookies. Even though I'm not stoking a wood kiln or making 200 pots before I can fire even one load, more and more I like to take good care with all the parts instead of being as casual as I used to be. I work through the aesthetics and I refine my practice as I go along. You might say I "study on" pieces. I want them to still evolve so the final pieces keep feeling fresh as I go through work cycles. I'm trying for deliciously good pots, too. There's always that push to the finish line. Even when I plan to deliver very early, I usually manage to end up being just a little early, or (mostly) just on time. Sometimes I don't make it, and have to push back the line. Sometimes I just won't take any more orders, so that I can finish what is already "on my (ceramic) plate"---and- this is important- so I can still have a chance to build my own body of work. It's a constant balance with handwork. I have one particular customer who is content to give me whatever time I need, and I am so grateful to her because life doesn't often bring artists customers like that. I always say yes for M-M! I value highly all of the regular customers I have and try to give them good and timely value. Incorporated into this, there's the always-present reality that it's just me, working by hand, in the studio, not a factory crew. I usually like it like that- but it is a challenge. And sometimes I get in a helper to mix the glaze and mop the floor when things get too busy. I try to dance with all that. I try to make pots that are my best. Of course, "best" is another line that keeps shifting the more years I work. There is always the biggest question, 'Does the world needs another thing?' to paraphrase the wonderful Danish wood firing potter Anne Metta Hjortshoj, and the late American potter Malcolm Davis, he of the frogskin shino glaze I loved, who (at a workshop I took with him once) talked about wrestling with that idea when he gave up his earlier work as an social activist minister. Artists probably all should ponder the Why and the Whether, the philosophical issues- while, to pay the bills (and satisfy the inner, urgent Maker Instinct, to coin a phrase), we keep right on with the How and the practicalities of what we do. Like other potters, I try to find my peace with each "another thing" I make. So... the latest bout of asthma is over. Good riddance to it. My next wheel students start an 8-week session today. There are bowls and jars to glaze besides, and a dozen freshly made cups needing handles. On with the show. Posted on November 16, 2016 by Mimi Stadler. In my pottery studio, I start working on Chanukah after Passover. I start working on Passover again a month or so before Chanukah. I need those six months per studio work cycle to produce holiday pieces. In other religious terms, after Christmas start making work for Easter, after Easter start again for Thanksgiving and Christmas. This is my calendar theory, mostly proven true, borne out by my experience. Last year I made a new variety of Chanukah menorahs, also known as chanukiot (singular: chanukiah). My new chanukiot, started after Passover, are a departure from last year's. One of last year's chanukiot. I liked last year's a lot, but wanted to make a version that weighs less and has more flat evenness at the top of the the oil cups. (I use oil instead of candles, and you don't want that oil to spill and cause a fire. It's just practical.) Last year's chanukiot were nice canvases for decoration on their large, flattened sides. These new ones have different possibilities, because the whole center is air. Each time I make a chanukiah in this series, I tweak it a little. Eventually I intend to get to a place where I like every technical aspect of the construction and all facets of the design, and will be able to more capably make quite a few that look and function well. The run of chanukiot in this family group will cap out at 250, over however many years it takes. I sign, number and date each one on the bottom. The change here is in the base, a hand-rolled and curled slab with decent thickness instead of a thinner wheel-thrown slab like in #1. The rounded rectangle part is taller. The shamash (the flame that lights all the other lights) is in the center instead of off to the side. (Both shamash placement options are good.) This one is fresh clay. Now, after laying out the theory about how to schedule my studio life to get work done on time, I'll tell you a secret...maybe not so secret. The reality is different, despite my best intentions. This process is more energy and time consuming than I can even budget for. First, there is the design, which needs to be absolutely functional and repeatable, while being my own in feeling and also in some way beautiful. There are surfaces which want to get decorated in a way that suits the piece and says something about my aesthetic. There's having to wait patiently till the thing is bone, bone, really bone dry, and then there is the bisque firing in the kiln. This has to go uneventfully. (Technically, that means the parts are about the same thickness, and well attached, besides being absolutely dry.) And then there is glazing, which can vary quite a lot in complexity depending what I decide to do. Coating with glaze and firing again to 2230 F at last, there should be no mishaps in the glaze, like having it run too much or crawl away from the clay body, or develop excessive crackle lines. While unsuccessful aspects of the process are, well, a bummer, successful aspects make me laugh out loud. There are ups and downs here. In the case of a new design, 6 months is sometimes just not enough to bring the product to market or even to establish it as The Chanukiah. But once I have it all free and clear of all possible design and completion technicalities...watch for it, because I am going to love making these. Does the saying, 'better is the enemy of good' apply here? I don't think so. Over the years of making pottery, it is developing a piece that will work on all levels that gets the art-in-clay part of my brain revving. This process is all about what the painter Robert Henri wrote, sometime around 1923, in The Art Spirit. "Keep your old work. You did it. There are virtues and there are faults in it for you to study. You can learn more from yourself than you can from anyone else. ...After you have made a drawing from the model don't simply put it away. You are not half through with it. It's a thing to study." Even after 31 years with clay, most of them including thinking and sketching and making various chanukiah designs, I am not through with working that best one out yet. Well, I am more than three quarters through with the best initial design here, and I see the light(s) somewhere at the end. Maybe I'm almost there. Probably not quite in time for Chanukah 2016. Posted on October 31, 2016 by Mimi Stadler. Since I was on a roll with these, I kept going, but varied the shape now, did not draw into the surface, and changed the colors around as I pleased. That last blue and silvery-black one has a nifty shape. It was the last one made, and as these things so often go, its squashy, almost heart-shape was a departure from the rest and the one I plan to take forward for tureens and cookie jars. Doing a run of a thing is like this sometimes. It unexpectedly takes the work on a welcome dogleg in a slightly different direction. A potter is like any solo arts practitioner, always trying to make a vessel her or his own way- "find her or his voice". Ask any potter. 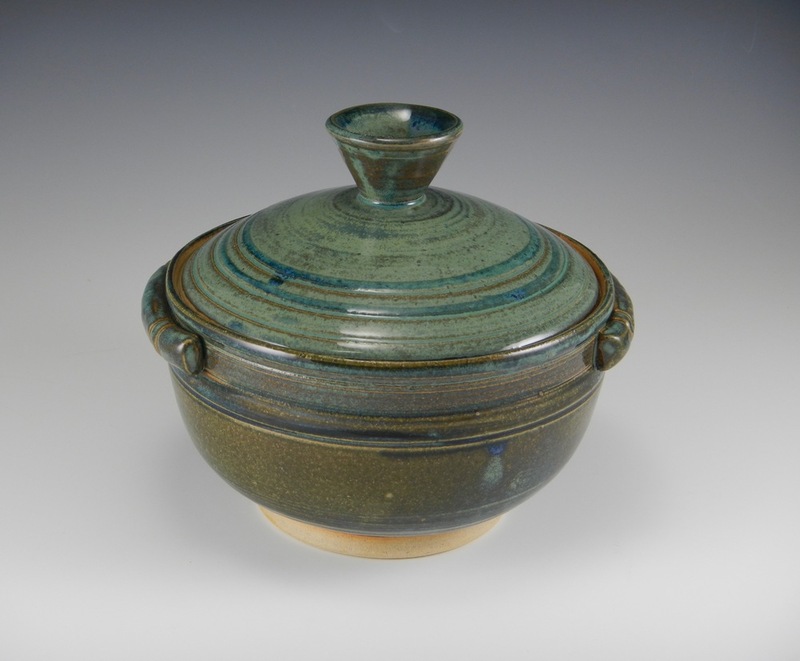 These pots are on my website and in my Hillside studio gallery and are mostly $60. The one with the big plate is $85. Come and get 'em while they're fresh out of the kiln. Posted on September 28, 2016 by Mimi Stadler. The Museum of Early Trades and Crafts -METC, for short- is located in Madison, NJ, 25 minutes from my studio in Hillside. The museums's current exhibition is about New Jersey's history of clay mining (there are tons of clay under our feet here) and small private pottery industries, which existed during the previous couple of centuries. Architectural ceramics was produced for the new, tall NYC buildings in the early 1900s. Nowadays, clay in NJ is mostly about studio potters instead. So METC invited me and Jane Biron, members of the NJ Potters Guild, to represent some contemporary ceramics in this exhibition. In the case at METC (photo, Mimi Stadler 2016) My work starts from the raspberry colored jar and to its right; Jane Biron's the 4 pieces to the left. Involvement in this project has been fun, and will go on being fun till December 31st, 2016, when the exhibit comes down. NOTE: I'll be doing a hands-on class at METC on Sunday, October 9, from 1:30-2:30 p.m.. It will be a fun intro to my style of teaching. Go to http://www.metc.org/ for more! The calendar currently lists activities through September 9, but I'll watch it for you. You can check my FB page (Mimi Stadler Pottery) for updated information. Good times! Posted on September 4, 2016 by Mimi Stadler. Long time no blog. Passover time I always take a couple of weeks' break, and we have a new grandson, who has been beautifully distracting. Still, I've been able to give the pottery biz a lot of head time. I've been shifting direction as a result. You probably know I've tried new things in recent months, since I put a photo of a successful sale in a shop window of a group of pieces. I'll try some more of that kind of selling. It's great to get wider distribution. I tried consignment at a NYC shop. Nice shop, well established, nothing to write about in sales. But I had to try. Finding the right venues is like kissing a lot of frogs before finding the prince. Or in this case, princes. This one might still be a prince- but I would have to be there in person, work in hand, not putting my work into their online shop. I did another boutique at a synagogue/church/school in a nice area (I lump them together because the shows are generally similar) and I already knew... My handmade work (next to the hat sellers, skirt vendor, beaded jewelry sellers and children's books and games marketer) won't sell at any price point above $25. Why did I do the boutique, then, you ask? I guess I needed to do just. one. more. (dope!) of these, to see whether it reeeeally isn't a good sort of venue... Temporary insanity. We'll call this experience a frog I've kissed too many times. The biggest shift is that I've been doing custom work. Just now I've been in the process of making really big personalized goblets, a whole lot of customized honey jars, and a dinner set, for three very good customers. The challenge is fun, and kindly do not sneeze at the great bonus of pre-motivated customers. They are more princely than princes. Meanwhile, look for some of my work at the Museum of Early Crafts and Trades (Madison, NJ) right now through December 2016! (There are a dozen pieces plus a clay figurative sculpture.) For a couple of centuries NJ had a thriving clay industry, both mining and manufacturing, which was pretty much over by the early 20th century. That leaves just us studio potters working in clay in NJ today. The museum exhibit will explore the change. I'm delighted to be part of it. As for studio potters today, the Potters Guild of NJ has more than 120 potters, and I meet and hear often of other NJ potters who are not yet members. There's a very real clay cottage industry besides the many hobbyists. It ain't over till the clay-covered lady sings! Posted on July 21, 2016 by Mimi Stadler. That's My Pottery in the Window! And these below plus lots of my other work can be found on the website only, at J. Levine Judaica, NYC (5 30th St, at 5th Ave). Type in my name in the search box for more! Posted on April 6, 2016 by Mimi Stadler. Hoo Boy It's Spring & I've Got Pots for You! Two good outlets are carrying my work now. 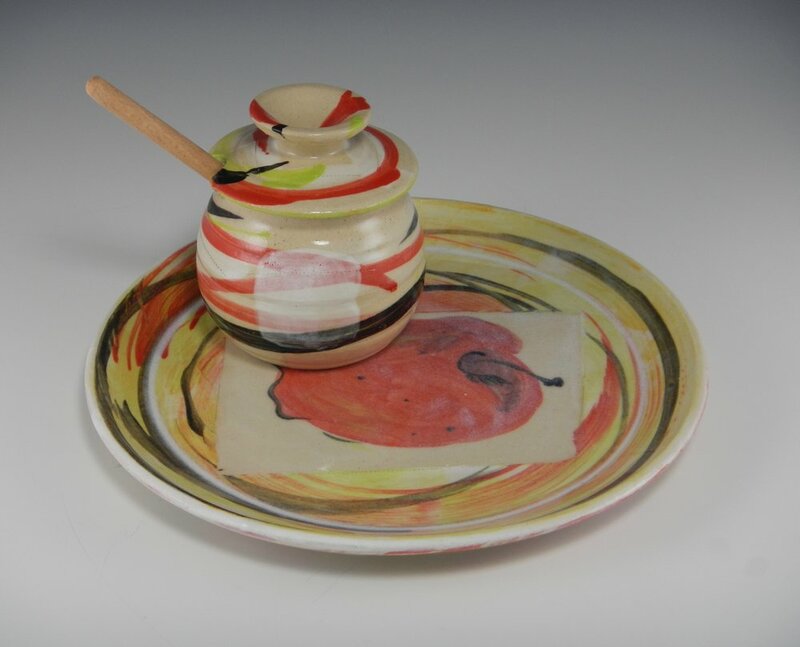 My Passover pottery is found on J. Levine Judaica's website. Seder plates, matzah plates, Elijah's cups and more are there. Seder plates, washing cups and also some very nice serving platters will be found at Judaica House in Teaneck, NJ in less than two weeks, so if you're in the vicinity, stop in there! I've added the word "matzah" to my matzah plates... why not? All over, in fact. As soon as the holiday is over, I'll be making honey jars with accompanying saucers. Look for a colorful new pomegranate design! In anticipation of the honey/sweet-new-year theme of Rosh Hashanah. I should have them for sale by mid-July. I'll be making lots of these. Twenty-five have already been pre-ordered! And then it's on to Chanukah menorahs. From a maker's perspective, December is around the corner. I have a new design to try. Not only does hope-of-good-design spring eternal, but once I've mastered the wheel-throwing technique for these, new to me but not complicated, I believe they will be fresh and appealing. I'm way psyched. Another example is a design I'm working on for big, funky stoneware flowers, a bouquet of bright blooms on bamboo stems, in a bright vase. So far it's an evolving idea, and a sketch. More on that in the fall! Posted on March 23, 2016 by Mimi Stadler. Yesterday, when the latest family traveller called to remind me she and her husband were on their way to our house before heading to the airport, I told her I was at work, but would stop when they got here and take them to the airport. When they arrived, I hurried to finish the web task at hand, turned off my work timer, and 'put on my chauffeur cap'. Since I'd told her I was working, my passenger asked me, "So what are you making downstairs? ", making accompanying hand gestures as if I had been at the wheel. I love how interested she is in the work, and she also buys from me for gift-giving, and I really appreciate that she cares to ask the question. You may not be surprised to know that she thought that's how I spend all my working hours. She's not alone in thinking it. It is probably how nearly all of a clay hobbyist's time would be spent. But since I'm no hobbyist (and since I've been keeping track of my hours with the Toggl app), I would estimate that currently, between 35%-40% of my time is spent with clay, glazes and kilns. The other 60%-65% is spent on all the rest! It's like the tree that falls in the forest...if I make my work but no one sees it, have I really made work? A major goal involves selling. I don't only make my pottery because I like clay. I also make it to fill what I perceive as a niche, as in my website slogan, "handmade objects in a mass-produced world". While I drove my relatives to the airport, I mentioned that I had been in my unofficial "other office upstairs", the kitchen table, spending nearly an entire workday editing photos of my work, putting them on my website, and generally going over the site as I have to do periodically to check for errors and anachronisms. I hadn't touched clay or glaze all week, but I had worked on plenty of other things. In addition to my website work, I had met with my business consultant, thought about and researched sales strategies, traveled to and approached 3 galleries, followed up with emails containing images, spent a couple of hours on an online clay course (Think Big 2: Mastering the Marketplace), took more photos in my gallery photo booth, taught my 2-hours-a-week studio assistant some basics about pottery photo-taking (she then did a surprisingly good job of it), went over my accounting, unloaded a kiln of finished work, posted images of studio life to my pottery page on Facebook (www.facebook.com/mimistadlerpottery), and blogged and posted photos about the new Seder plate that I would like people to be aware of. I dropped the family off at the airport, and went back to the kitchen table to add more photos to my website. All in a day's work! Posted on March 3, 2016 by Mimi Stadler. I've been wrestling with Seder plate design for probably as long ago as the beginning of my potting life in 1985. I grew up with Passover Seders ("Sedorim" in Hebrew) and know many who, like me, continue to make two Sedorim every year. So this is a natural item for me to try to do well. You can substitute 'conquer' instead of "wrestle", if you want. In any case, if the long years of many unsuccessful tries were a wrestle, I finally feel that I've pinned the sucker to the mat. Suddenly it feels kind of easy. Here's how I do it. I roll out a very big slab, cut out a large round shape, impress the fresh clay circle here and there with a matzah-patterned texture (I made the latex texture mats myself), and lay the circle into a 20" round shallow form (made of clay by a friend) to help it settle into a gentle curve. Hand drawn designs, red dots for a placement key for 6 small dishes, pass the whole shebang through a couple of kiln fires, and voila! 17" diameter Seder plate with dishes. An overnight success after 30 years. $140, at my space in The Gallery Downstairs and here on my website on the Jewish Life page. Posted on February 25, 2016 by Mimi Stadler. Commercial underglazes, formulated to fire at about 1800 F, applied to the pottery as soon as the pots are finished being trimmed on the wheel in the raw state; these have been taken to 2232 F (cone 6) under my clear glaze. They darken or fade from their original colors a little bit. But the original colors are still vibrant. These small plates are to hang on the studio wall for reference when customers order dinnerware! I already have 7 non-underglaze glazes that have been in regular rotation for a few years. Now, out of a round of new glaze tests, I found these to add (below). They have tonal variation within them that is rich and interesting when they are layered over the gray-white Cornwall Stone glaze. I got mottled pink-red (red chrome satin) and spearmint effects! Hoo ha! Posted on February 4, 2016 by Mimi Stadler. With bisqued pots in various glazed stages, an experimental Chanukiah (Chanukah menorah) ready to go into the kiln, recently photographed pots up on the website, and a to-do list as long as my arm, I was totally distracted today by a pot I handbuilt 20 years ago that I came upon just a few days ago. If I had better motivation this week, I would not be writing. I would be decisively choosing glazes to finish my recently bisqued dinner plates and bowls, salad bowls and more. But I'm lacking focus. Happens. I used to have a used old restaurant kitchen cart in my kiln room. But it was not as good as the more recent wheeled shelf units I've been using for a few years to take pottery to and from the kilns. This old restaurant kitchen cart had accumulated a couple of decades of bits and pieces of things, including the sample projects I used back when I ran the Pottery Shop in Camp Simcha until 2001, things my children made long ago, and things I didn't really know what to do with. I found other spots in the kiln room to put everything from the cart, and washed down the shelves and frame, sending spiderwebs and clay dust and yellowed price labels to the trash. Then I took the clean cart to my overstuffed, disorganized gallery office corner to neatly store shipping materials. But I was not done until I washed the dust off this old vessel that had been sitting on the bottom shelf. About a foot tall and 10" wide, it is handbuilt, reddish brown, with satin black-glazed interior and a lightly carved, pale blue collar. On the bottom I had signed it and dated it- 1996. It weighs a pretty serious 12 lbs. 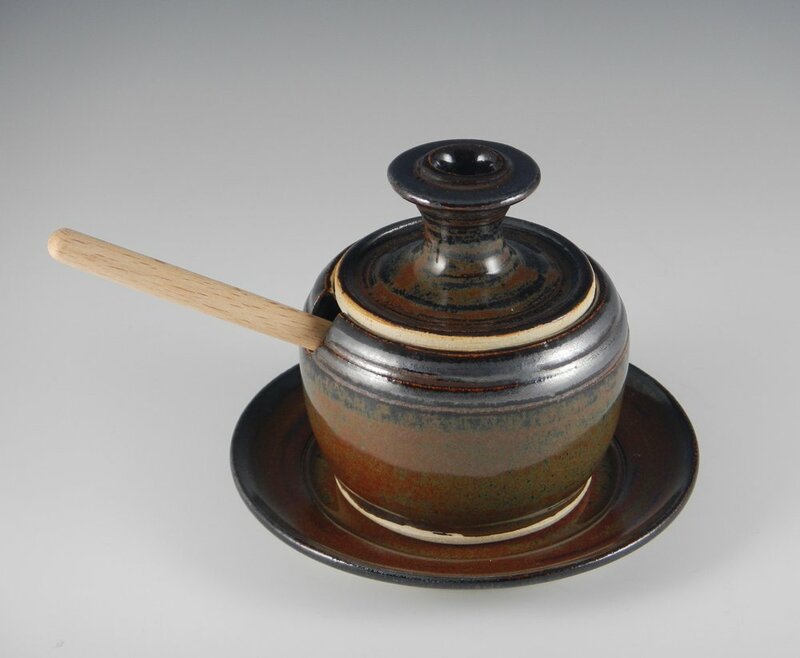 Twenty years ago I was working with light colored stoneware that I fired to Cone 8, which is something like 2370 degrees F. I didn't like glazing. (Still not my favorite, but I got a grip on it at some point over time!) I was very influenced by the coil-built pottery seed storage jars of the American Southwest, and African water jars, and the simplest ancient Japanese functional vessels decorated with earth pigments rather than glaze. So I built this pot out of thick coils, stained it with red iron oxide (some thicker and some thinner application, apparently- see the blackened spots), and cut and closed darts out of the round shoulder to make a narrowed upper profile. I added a collar/rim and brushed it with blue-stained slip, then carved it with a pattern of lines. We start with ideas (maybe this is the term "talent" I've often heard thrown about so carelessly? ), and as we learn and grow we spin out those ideas more and more intriguingly. Hey- thinking this through and writing it down has helped me focus- and get back to the glaze table. ..Now what to do with that old coil vessel..? Umbrella stand? Corner pot? Historical pot on the hearth? Gallery decoration? And of course, if someone loves it enough, sell it..? Posted on January 27, 2016 by Mimi Stadler and tagged Tracing pottery techniques through time. What now? It's time to consider. Seasonal orders are filled. Although two customers are not getting back to me, one has a deposit down and the other has to show up before Christmas to pick up the gifts she asked me to make, so I'm not worried. Everyone else has what they asked me for. What a relief! Meanwhile, what "after the holidays" means in this studio is, I'm heading on to the next holidays! I'm thinking Passover now. And there are always Sabbath items- that comes every week and these things make great gifts. And in between matzah and Seder plates for Passover, and challah/bread baskets for Sabbath, and because many of my customers are not Jewish and don't need those things, I'll make the bowls and salt & pepper shakers and goblets and serving platters I like to make. Salad bowls are in short supply here after the sales recently, and I really love making those. A customer friend wants a set of dinnerware. In short, I will not be bored, and the website and Gallery Downstairs will be replenished, and happy customers become returning customers and friends. It was a good pre-holiday sale season for me. I did shows and made sales I wouldn't have if I didn't come up out of the studio and "get out there". I shipped out some things via website sales, too, more than I expected. Some more went out of The Gallery Downstairs with in-person visitors. I kept track - that's new for me- of hours and what I worked on, so I can do a productivity study after 6 months and again in a year. In general, I'm pretty happy with the work I make lately, and enough other people seem to be, too. I guess I'm sort of an overnight success after 30 years. As long as I can do this work, and teach a little, and have friends and family to care about, "good" is 'not enough said'. Most of all, I have been married to my best friend for a long time now, and he helps dramatically to bring balance in my life, as well as provides health insurance and some essential solvency... Because it would be really hard to go it alone. Potters need friendships, and life balance to all that solo creating, and health insurance is irreplaceable. Going forward in January, I plan to add a second electric wheel to the studio, so I can have 2 wheel-students at a time. People learn better if they are with a friend or colleague, I believe. Since I already have my trusty Lockerbie kick wheel, my workhorse for the last nearly-30 years, and Lockerbie makes motors for these at about a third the price of a new electric wheel... I do believe there is a 2nd electric wheel in my very near future, and I now dub it "Trusty Old Model K". Because I like to leave you with pictures, here are four new tureens, small and I think kind of snazzy; a goblet in ever popular blue and white; and a pair of green salt & pepper birds. Posted on December 22, 2015 by Mimi Stadler. The "selling season" arrives twice, in November-December and March-April. The pre-winter one is all about "holiday shows and sales", and the pre-spring one is before Passover and Easter and the new spring leaves on the trees, which seems to make people desire something new and fresh. For the potter, this pottery business is most happily about the making. This photo from around 2011 says it best. Making is engrossing. Here I am at the very beginning of a goblet. But selling is the other bookend bracketing my business. Selling; that's as challenging as making. It would be great if everyone loved handmade pottery and wanted to own it. But here's how it really goes: The handmade aspect attracts the relatively few who, in their unsnobbish way (as I make and sell unsnobbish pots, which they seem to understand), are kind of select. I understand that and don't expect everyone to jump up and down every time I unload a kiln. (Fortunately, I have one or two who do!) Most all of my buyers just come along here and there, at random times including times of need-of-gift, and are individuals who have curiosity and willingness to not always be like everyone else and go for the thing everybody has. I like the part where I get to talk with people. It might be the same conversations many times over- 'How long did it take you to make that? How do you get the shiny finish on the piece? What is the oven like that "bakes" it? Why is there no glaze on the bottom? Do you draw this freehand?' I'm OK to have that conversation repeatedly. It's education and connection, after all; most people don't have 30 years of pottery education to know these things without having to ask. The people are unique and separate individuals. Even if the piece doesn't get bought after, the conversation is still good. Most of the time in my working life, except while I am teaching, I am in semi-seclusion in the studio. But people, after all, are at both ends of the handmade pottery transaction. Potter>>>allthatprocess<<<Buyer! In the end it becomes a sociable transaction. The pot didn't come off an automated assembly line, and neither did the person who made it, or the person who bought it. I think about the person enjoying using or giving this thing I've made, that they liked enough to think about and want to touch and purchase. The pottery connects, as does every handmade thing. It bridges gaps. It finishes a circle between people. Posted on December 8, 2015 by Mimi Stadler and tagged handiwork connects people. 1986. First Chanukah menorah (known as a "chanukiah") design. Worked on it so long... I had just taken Ceramics II at Kean College. I threw a basic bottomless cylinder from earthenware on the wheel, cut it right down the middle from top to bottom, and attached the halves end to end. Then I rolled a slab and cut out the stand-up part with the lettering carved in it, assembling and glazing everything in my own first pottery workshop in a corner of the basement. I made small white cups for it that, when Chanukah came around, I filled with olive oil and put a wick into. I no longer have the cups. They rested on the strip in the center of this chanukiah base. Honestly, if you make a cylinder, it's going to be round. If you don't flatten it out somewhere, it's not the best place to rest little cups on top of, at least if you want them to sit securely. Truth- I ended up just melting the candle ends in place on the top of this chanukiah, not using oil cups. ...Notable with this one: it was my first time using gold luster. (Tip: Do not attempt to place a pottery chanukiah with metal luster in the microwave to soften the wax on it for cleanup. Unless you like to watch sparks fly.) I have hardly used metal luster since. It has stinky, toxic fumes when raw, best applied out of doors, and it is finicky. 1986-87. Played with small versions just to see how they would come out. My kids have them now, so few photos were quickly available for this story. Here's one I still have, that my son did with me when he was 9. I gave him the idea of a bent slab, and he did the work. Pretty neat for a 9-year old. It's supposed to resemble the Western Wall in Jerusalem. I think all I did was fasten a coil around the edges to clean up the form. 1987. My second large design. 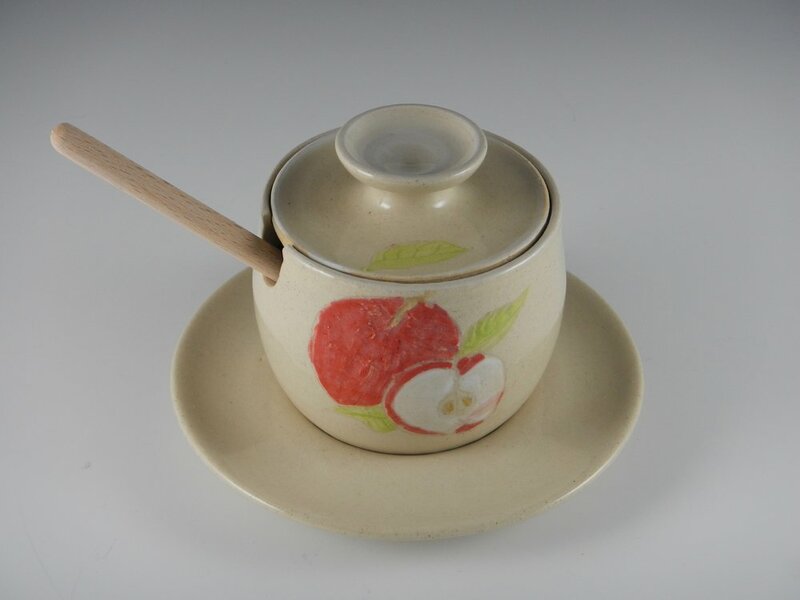 Reddish stoneware, heavily pebbled ("grogged"). It was built as a castle-like construction and was lots of work. Learned: clay slabs distort easily. They move and crack if not handled "just so". Also, it was an interesting foray into staining clay with metal oxides. I made another, similar one. As a design idea, it was received in an unexpected way: a Holocaust survivor was reminded by the similar one to this Chanukah menorah of the wall at Matthausen concentration camp where he had been imprisoned, when young, during WWII. Drawings, attempts, a carved sculptural chanukiah that cracked in the drying, wheel thrown elements I attempted to assemble into something cohesive... It has been a long, long journey to make a Chanukah menorah I want to make again and again. This is my Everest. Here's a candle chanukiah I tried a few years ago. This had stresses in the drying as it is made of layers and attached bits, but I dried it slowly so it was unable to really warp as it could have. The glaze was interestingly runny and played peek-a-boo with my lettering, which reads "Chanukah" in Hebrew. I have this at $45 in Jewish Life on my site at the moment. They work well with standard candles melted/stuck into place, then lit. They are the best design concept yet in my studio. But now I am working with the promise of next year in mind. (I am always working with the promise of next year in mind.) I am working on the sort of Chanukah menorah that will operate at the whim of its owner with either candles or the little glass cups that come pre-set with olive oil and wicks in them. That design idea is still developing, although here is the first one of those, that works pretty well. I found rubber inserts that accommodate retrofitting for glass oil cups, and tried them out in the channel at the top of the chanukiah. 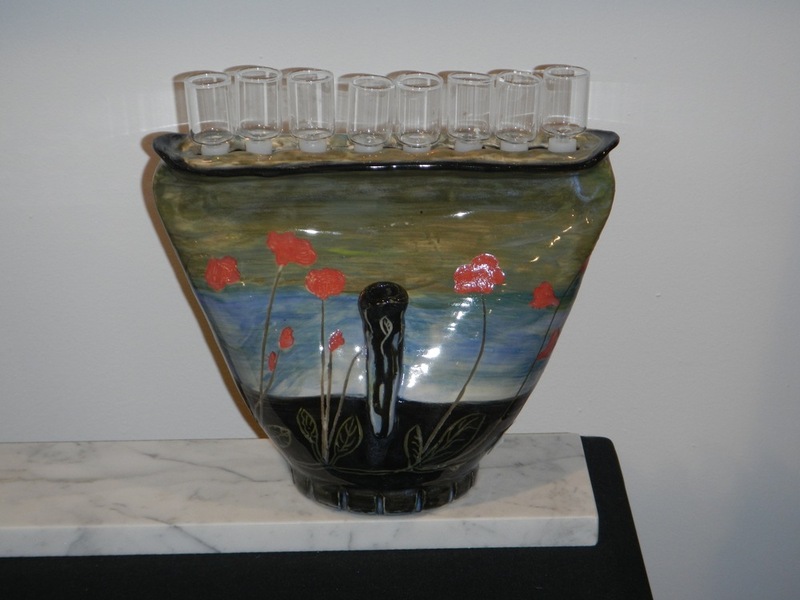 The shamash (the "middleman" candle used to light the others) will sit in the holder on the front. A certain amount of engineering/problem solving is needed in the making of a thrown piece where the top has to stay level all through shrinkage and its accompanying slight movement and distortion in the kiln. This has been a bit of a challenge, but I'm on it. Posted on December 1, 2015 by Mimi Stadler. I've been making different dinnerware pieces on and off since March. Lots of different permutations are possible using my GR Pottery Forms hump molds with rolled out clay slabs, and experimenting with textures and colors. I'm adding to the GR ones other infrastructural forms I've made myself. Potters are hands on by nature (or we would not be potters), and we make or adapt tools so that we can give expression to our own work. I don't want my pottery to look like the next potter's, but the next potter might use these GR forms for shape continuity through a set. So I use my own additions and subtractions and changes to express my ideas as the next potter would probably not. Here were the first items made, with medium and small plates done using GR Forms, and bowls made using my own paper template. It was a sweet set, a bit on the smallish side, with extremely simple color- just an inlaid black line and a few strokes of pale rainbow here and there. Tried a few colors. Added a thrown and squared 8 oz mug. I wanted a bigger version of the dinner plate, so I broadened the rim of the next one I made using the basic GR plate hump plus a larger wooden square under it that added 2" to the diameter, to 10.5". Here it is below in red, with stamped decoration. Surface and color possibilities are only limited by my materials, firing methods and expertise. Then I made the platter again, and this time the lace impression was shallower, which works well- kind of elegant, I think! I can add handles for another, different look and feel. That's on the "to try" list. Thinking of the table service, I wheel-threw and altered my own salt shakers. Next time I'll do some in coordinating colors! When I take GR's basic hump forms and build over them with slabs, I can repeat sizes and shapes of wares. Everything I add beyond the basic form is what makes the work mine. Posted on November 17, 2015 by Mimi Stadler and tagged handmade dinnerware. All I want to say is, today (another first) I was not the one to mop the studio floor at the end of the day. November 5: Have been continuing with studio assistant once a week. Studio is being maintained and someone who was not me weighed out and mixed up test samples of glaze (from recipes) for me to glaze fire on sample tiles. (Maybe a decent celadon will finally come out of this effort..?) Today I am going to make a mess glazing pots. But later someone will help me mop. Then I am going to do inventory for two upcoming events, and choose pots, price, list, and pack them- with help. Here's a pottery photo or two just to keep things lively. Posted on November 5, 2015 by Mimi Stadler.